The centre-forward of the hockey team didn’t pass the ball to other players, in the past tournament, due to which the team was defeated. In the past ten years, the passing percentage of CA students has increased. In the first sentence, pass (base form of passed) is used to represent handing over something, but past is used to describe something that took place in the previous time. 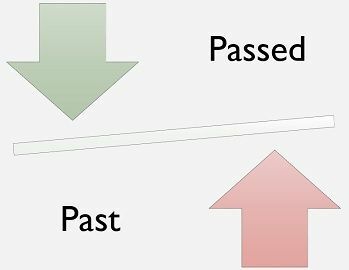 In the next one, past indicates the earlier time, but passing (present participle form of passed) is used to mean the percentage of students who cleared the exams successfully. Meaning We use the word passed when something goes by, elapses, gets success or moves ahead. We use the word past to denote something which is completed, ended, gone by or occurred previously. Part of speech Verb Adjective, Noun, Adverb and Preposition. Examples Diya passed the sheets to me. We'll meet at November 29, 2018, at twenty past three. More than one hour has passed. Jane's past experience in marriage was not so good. I wonder how Robin passed his high school exams? Nowadays, many citizens work past their age of retirement. If you pass the bakery on the way to home, please get me some cupcakes. A cab passed by when I was standing at the bus stop, in which I saw Peter. One should not buy such medicines, whose expiry date is passed. The date to apply for civil services exam is passed. The company’s anticipated worth may pass ₹50 billion, by the end of 2018. My sister had passed the IAS exam, in 2016. Could you please pass this message to Mr Poonawala? Robert’s father passed away from a heart attack. As the time passes, everything falls into its place. Our loan application is passed. The Supreme Court passed judgement on the Right to privacy, as a fundamental right. The temperature is highest in Rajasthan in the past ten years. In the past one year, the company’s sales have shown a tremendous increase. She left for the interview at twenty-five past ten. There are many things to learn from the past. She was the past Chief Minister of Rajasthan. The past month was hectic. The teacher took our sheets, as it was past the exam time. Her hostel is in Shivaji road, just past the university. The word pass is the past form of the word ‘pass’ which means to cross, clear, transfer, or complete something. On the other extreme, past means preceeding, it refers to something which existed in the previous time or that has already happened. The word passed is a verb as it shows a direct action. It is the simple past form and past participle form of the verb pass. As against, due to lack of any action, the word past is not a verb, rather it can be used as an adjective, noun, adverb and preposition in sentences. To use these two words in sentences, just do one thing, when you talk about movement, use passed, but when you talk about previous time, use past. Mr Sharma passed away a year ago. She just passed the mall; she will be here anytime. The GST bill was passed in 2015. The criminal was guilty of his past crimes. For the past one year, She has been working for an NGO. In the past, I used to play volleyball regularly in the evening. The first and foremost difference between passed and past is that while the word passed ends with a ‘d’ sound, the word past has a ‘t’ sound in the end. Furthermore, the word passed is nothing but the past form of the verb pass, but past itself is a form of the verb.